An unreserved congratulations to all gallant Biafrans for massively observing the 30th of May, a yearly ritual, as a day of sober reflection on the memories of our innocent mothers and their children who became victims of collaborative genocide, as well as our gallant heroes and heroines, who in the process of defending our then freedom and lives, lost their own lives. diplomacy, has once again stared in the face the fleeing members of the vulturous global coalitions - who are in conspiracy against Biafrans. They may only run for a while but may never escape nor be able to cover the holy truth of both the indomitable prowess of Biafrans over the course of the restoration of the interrupted sovereignty of the state of Biafra. Biafrans, we have once again shown that we are a people with a non-defeatist character of resilience, determination, zeal, reasoning, unimaginable, unseen, uncommon and daring latent energy, which the entire World looks at and gets amazed even though some others shy off in obvious envy, inferiority complex, lack of capacity to stand a competition with us, and their unreasonable grandstanding against anything great and innovative. We have shown that as a people it is generic for us to object anything which suggests appropriation of inferiority complex hence we can not succumb nor adjust to slavitude. Our detestation of anything suggestive of slavitude was exemplified in the great 'Eboe landing' of some of our siblings, who became victims of the unfortunate human conspiracy of forced labor, via the merchandization of the human person, popularly called slave trade. History has it that a contingent of Biafrans of Igbo extraction, onboard the criminal slave-ship-America-bound, to face hard labour and especially the uncertainties of the purveyors of the raging slave-trade at the time, in unison, chose death to face the uncertain outcomes of the evil of slave-trade, in a foreign Land, in far away America. These innocent siblings, summarily agreed to all drown than continue in the voyage and navigation that has no certain future. Another global hallmark of BIAFRAN determination was also seen in the brevity of 'Olaudah Equiano', the IGBO-BIAFRAN slave, who bought his freedom from his master at the rate of 40 Pounds. Olaudah Equiano, as globally pronounced in the history of black slavery, went ahead to become an instrumental figurehead in the liberation of all black slaves Worldwide and the establishment of the nation called Freetown in Sierra-Leone. He perfectly distinguished himself by his open display of hate for slavery and determination for freedom. "Biafran-ness" is synonymous with liberty and freedom - saying NO to slavery. Our collective decision to SIT-AT-HOME on the 30th of May, shows on our part, a determination to never give up on our collective NO to slavery. We have shown by our resolve that we can, we will and we must restore Biafra. Our capacity to keep fighting until Biafra is restored has proven incontrovertibly. The World has yet seen another round of unison and collective bargain, and that nothing changes our stance. Dim Chukwuemeka Odimegwu Ojukwu, in his proclamation of the determination in our revolution, said "We the people of Biafra, proclaim with pride the thing known as the BIAFRAN revolution"-Ojukwu was right to use the word 'Pride'. Our collective display of boldness in character and strength of purpose at the time could be vantage point of birth, to that historic proclamation by our Dim, the first BIAFRAN Head of state. It could have been the height of insensitivity, lowliness, idiocy, wickedness, stupidity, illiteracy, primitivity, insensitivity and in fact inferiority complex, for us not to have registered our recognition of the great feats displayed by our gallant brethren. Heroes and Heroines day, as celebrated across the length and breadth of Biafraland, on the 30th of May, 2018, like the St Patrick's day in Finland, and the Holocaust remembrance day in the Jewish state of Israel, are global sanctities, that have taken their place as our own vicissitudes. All those, complicit in the unprovoked butcher and massacre of Biafrans from 1945, 1952, 1962, 1966, 1967-70 and the sustained spree, since the advent of the millennium, till date, have no choice but enjoy the pain they go through, as we remember the Biafrans, who were victims of global conspiracy from 19th century down to this present millennium. To the world at large, Biafrans have shown that the gory pictures of the horror, mayhem, juvenile and child death, which were prosecuted against peace-loving Biafrans still hurts them. It has come to stay as one of their own vicissitudes of life. And nothing changes the remembrance, so long as men walk on this Earth. 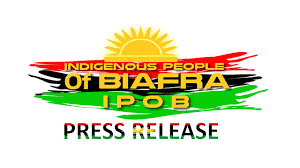 Therefore, we thank all Biafrans from the provinces of Igweocha, Enugwu, Ebonyi, Bayelsa, Akwa-Ibom, Cross-river, Omambala, Delta, IMO, and Abia provinces particularly, and all observers Worldwide. The success of our SIT-AT-HOME reverberates till date, as a resounding topical issue among many Governments Worldwide. Many media platforms are still discussing the impact of the massive compliance to the Sit-At-Home order. Once again, congratulations to all Biafrans for respecting the memories of their gallant heroes and heroines who lost their lives defending their right to freedom; and those who became victims of massive genocide. With this gesture, you have communicated your unfettered determination to pursue your freedom against all odds till you sing the song of the Highest in the land of freedom, Biafra - the land of the Rising Sun.